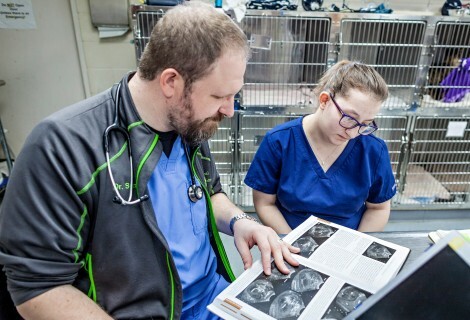 Honaker spent her spring break interning with OWU graduate Dr. Sam Valerius ’08, a veterinarian at the Animal Care Unlimited clinic in Columbus, Ohio. 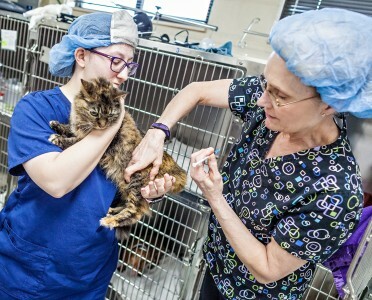 As part of her OWU Connection experience, Honaker was given the opportunity to observe the daily procedures and routines of working with animals. “I got to the internship at 7:30 a.m. and immediately vet techs were giving medication to our hospitalized animals and checking them out to make sure they were OK.
“By 9 a.m. doctors started showing up and first appointments started and, depending on which doctor was doing surgery on any given day, then surgery would start. It would get very hectic throughout the day with everyone in one area and all of the animals coming and going for surgery or appointments. “My biggest eye-opener was just how many different animals that they see and care for on a daily basis. Also the amount of death that I saw before 11 a.m. was astonishing and sad, but the good definitely out-weighed the bad.